Our 2017 Green Industry Benchmark Report revealed that 55% of small lawn maintenance businesses don’t have a website. For the frequent reader (if there are any) you’re probably sick of hearing that. This stat has already spawned a few topics (for those interested, you can learn green industry digital marketing terminology or how to brand your green industry business on a budget). 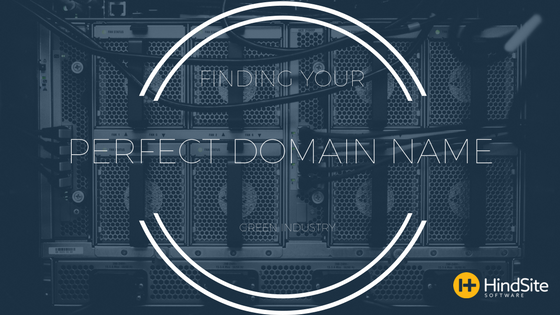 But we’ve yet to explain one of the more important aspects of creating and having a website… finding that perfect domain name. Before you go all Dr. Frankenstein, binding random industry terms with your business’s name and checking if their available, Do a little research on the local green industry landscape. Think of ways to make your domain - not merely a tool - but a weapon that clubs the competition. Websites with keyword rich domain names - including at least one search term - are nearly twice as likely to be clicked on by search users. And double the clicks means, double the visitors. Start by asking what a customer would type into a browser to find your business. For example, a Seattle irrigation company named “Johnson & Sons” could have seattleirrigationinstallation.com as their domain name. It’s not the most original but it could result in some heavy traffic. Incorporating your location makes your website locally relevant both as a brand and for SEO purposes. It can even express community solidarity, and that’s never hurt a business. A name that’s easy to pronounce is easily remembered. This has to do with a psychological principle called “processing fluency” and it has some real world proof. A 2006 study showed that, a week following their IPO, stocks perform better if their name is easy to pronounce (i.e. fluent) and if their stock symbols are pronounceable (TAC) versus those that are unpronounceable (TCK). There’s a fine line from being original and creative and being confusing and pointless. And that means you should avoid tomfoolery by not using words like tomfoolery in your domain name. Toss the options that include any long, hard-to-spell, exotic words. In other words: keep it simple stupid. Having numbers or a hyphen in your domain causes two problems. One, it can be awkward to pronounce. Hyphens - especially - can be an enunciating pothole (see?). Two, it can cause branding issues. For example, websites like johnson-sons-irrigation.com or johnsonandsonsirrigation33.com can rupture continuity of your brand. Align your social with your domain name. This makes for a consistent digital journey for potential customers. When it comes to domain names, the shorter the better. If possible, try to keep it under 10 characters or 2 words. Is it engaging and memorable? Can it stand the test of time (longevity)? Sounds good when you say it? There’s a pile of domain name suggestion tools online. DomainScope is a solid option since it incorporates many of the best practice mentioned above. Plus, it’s pretty simple to use. Just type in keywords of interest and it’ll generate a list of relevant options. There’s even a tool that shows recently expired domain names. When done right, a domain name can propel a business past its competition and open doors of opportunity. But this requires some work and a thoughtful approach. If you’re on a website creation kick, check out our eBook below to learn how your website can turn visitors into customers.